Pre-heat, work area heat, and post-heat can be configured to your system as add-on options for more effective dispensing of heated applications like underfills, COB encapsulation, Dam and Fill, and more. Pre-heating raises the product up to operating temperature. More aggressive heating may be applied to this zone to decrease the amount of time required to bring product up to temperature. Work area heating normalizes heat on the substrate. 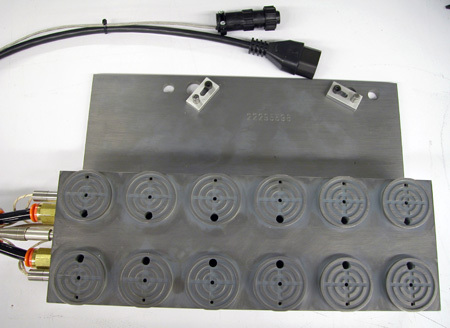 Heat in this zone is typically applied via a contact vacuum fixture for utmost uniform heat transfer. Post-heating is typically used to maintain product temperature and continue fluid flow. Heating may originate from forced air or contact fixturing.